AUCTION DATE: THURSDAY, JANUARY 9, 2014 – STARTING @ 11:00 A.M.
CRAVEN 30’’ X 14FT ENGINE LATHE, 4-400 RPM, 4’’ THRU HOLE, S/N 15999/10. SUMMIT 30-4-120, 30’’ X 120’’ LATHE, W/ 4’’ THRU HOLE, S/N 810904. NARDINI MS-1640 ENGINE LATHE WITH DRO. TRUMPH VERTICAL MILL WITH DRO, P.F., VAR SPEED, 9X42. BRIDGEPORT, BIRMINGHAM VERTICAL MILLING MACHINES. BIRMINGHAM YCL-1236, 12 X 36 GAP LATHE. GARDNER DENVER ROTARY AIR COMPRESSOR. 2) SULLAIR LS-12V-50 AND LS-160-75H, 50HP AND 75HP ROTARY AIR COMPRESSORS. VARIOUS SAND BLASTERS, GRINDERS, AND DRILL PRESSES. LARGE SELECTION OF POWER TOOLS, INSPECTION TOOLS, DRILLS, TOOLING AND ETC. FREIDRICH SCHMALZ O.D. GRINDER, MODEL R.6/3000, 12’’ X 96’’ (APPROX), S/N 36278/1. CINCINNATI NO. 2 OM REBUILT CENTERLESS GRINDER, S/N 2M2H1W-412. 2) ACCURATE NO. 2 CENTERLESS GRINDERS. STUDER RHU-850 OD GRINDER, S/N 401.51. JAKOBSEN 10 X 30 SURFACE GRINDER. 1997 ACER SUPRA 1428AHD, 14 X 28 HYD SURFACE GRINDER WITH CONTROLS. TRIPET 8 X 18 HYD SURFACE GRINER. OKAMATO ACCUGAR-124N, HYD SURFACE GRINDER, S/N 6776. CHEVALIER 1632TX, 16 X 32 HYD SURFACE GRINDER. BLANCHARD NO. 18, 30’’ ROTARY DISC GRINDER. 3) 1998 YANG SML-20 CNC LATHES, FANUC OT-D, 8 POSITION TURRET, 3J COLLET NOSE, CHIP CONVEYOR, S/N C10097, C10084, C10072. DOOSAN VMT-36A CNC MACHINING CENTER WITH PALLET CHANGER, FANUC 10i-M CONTROL, 12ATC. 2) COMET ADVANCED VMC-1000 CNC VMC WITH MITSUBISHI CONTROLS. 2001 BROWN & SHARPE GAGE 2000 CMM, S/N 0501-1749. 2000 MITSUBISHI W2IRAS-1 CNC WIRE EDM, S/N 00281. MITSUBISHI M25 SINKER EDM WITH SYSTEM 3R TOOL HOLDER. AGIE SIKER EDM MODEL FUTURA IV. ELOX SINKER EDM WITH FANUC 11M CONTROL. TRAK TRL-1440, CNC LATHE WITH ELX COTROL, S/N 0811DH16372. BRIDGEPORT CNC KNEE MILL WITH EZ TRAK CNC CONTROL. 2) BRIDGEPORT CNC KNEE MILL WITH PROTOTRAK MX2 CONTROLS. 6) CHEVALIER FCL-1840A CNC LATHES WITH ANILAM 1200T AND 4200T CONTROLS. 1991 KOMO VR-805HP, 3 HEAD CNC ROUTER, FANUC 15M, 5FT X 8FT TABLE, S/N 623191. 2000 STANDARD AB200-12, 12FT X 200 CNC HYD PRESS BRAKE WITH AUTOGAGE CNC –99. CINCINNATI CB-90, 10FT X 90 TON HYD PRESS BRAKE, S/N 44372. CINCINNATI 13FT X 3/16 POWER SHEAR WITH POWER BACK GAGE. WYSONG 10FT X .25’’ MECHANICAL POWER SHEAR WITH P.B.G. HACO PPES-100-10, 10FT X 100 TON CNC PRESS BRAKE. HACO BC-45, 12FT X 110 TON HYD CNC PRESS BRAKE. HTC 154G, 20FT HYD PRESS BRAKE, S/N 373663. AMADA RG-100 CNC PRESS BRAKE WITH AUTOBEND CONTROL, S/N 101673. NIAGARA 7-72, 6FT INITIAL PLATE ROLLS, 7’’ ROLLS, S/N 59088. NIAGARA 76B, 6FT X .25’’ POWER SHEAR. PEXTO 10UH14, 10FT X 10GA POWER SHEAR. CLARKE AND LEWIS CL-200, 1.5’’ TUBE BENDER WITH DIES, S/N 0241. 1987 AMADA ARIES-222 CNC TURRET PUNCH, 22 TON, O3P CONTROL, THIN TURRET. HAITIAN ASC-11A SPRING COILER, .015-.072. 2) TORRINGTON W-10 AND W-10A SPRING COILERS, .008-.028. BAILEIGH SHRINK AND STRETCH MACHINE. 2) MILLER 200 MIG WELDERS, DYNASTY 200, LINCOLN 125HD MIG WELDERS. ACME 50 KVA SPOT WELDER W/ ENTRON CONTROL. 2008 HAAS TL-1 CNC TOOL ROOM LATHE, S/N 3081106. 2005 HAAS TL-1 CNC TOOL ROOM LATHE, S/N 69545. HAAS HRT-210 4TH AXIS ROTARY TABLE. 1992 HAAS VF-1 CNC VMC, S/N 1401. 2010 MAG FADAL VMC-3016FXMP CNC VMC, 10,000 RPM, 24 ATC, S/N 0120009012018. 2007 MAG FADAL VMC-4020 CNC VMC, 10,000 PRM, 21 ATC, S/N 012007059954. 2000 REBUILT FADAL VMC-4020 CNC VMC, CT-40, 21 ATC, 10,000 RPM. 1992 & 1990 FADAL VMC4020HT CNC VMC, CT-40, 21 ATC. 1989 FADAL VMC-40 CNC VMC, CT-40, S/N 8910677. 1998 AKIRA SEIKI V-4A CNC VMC, 24 ATC, PERFORMA, MITS CONTROL. 1999 AKIRA SEIKI SV-1000 CNC VMC, 40 TAPER, MITS CONTROL, SIDE MOUNT TOOL CHANGER. NIGATA EN40B CNC HMC, FANUC 6M, 40 ATC, 40 TAPER, 15’’ PALLETS, S/N 16479. 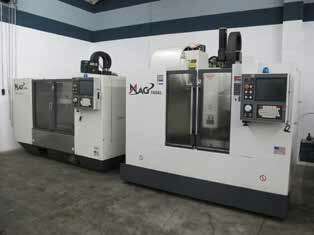 SUPERMAX REBEL-1 CNC VMC, FANUC OM, 4O TAPER, S/N 804872. 3) SUPERMAX YCM-TC-15 CNC LATHE, 3J COLLET NOSE, TAIL STOCK, FANUC OT, CHIP CONVEYOR, S/N 904485, 801420, 805404.